As many of you will now know, the author of this blog, John Perreault, passed away unexpectedly on Sunday, September 6. I first got to know John in the late 1990s when he came to the Pilchuck School north of Seattle on a press outing we were both attending, and we hit it off. He had the gift of keen insight, delivered wryly and in an often slightly naughty, conspiratorial way, as if he had just let you in on a self-evident truth that others weren’t yet admitting to. I liked him immediately. When, a few years later, he graciously agreed to let ArtsJournal host Artopia, I was thrilled. He generously said that he had been looking for a long time for a place where he could publish without the usual constraints of traditional publishing. 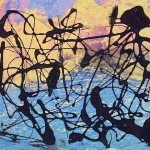 His long essays and reviews here on Artopia are rich with insights on the artists and work that caught his attention. The New York Times: Mr. Perreault started out as a poet and painter, but after being recommended by the poet and art critic John Ashbery, he began writing criticism for Art News. In 1966, The Village Voice made him its chief art critic, and he used the position to make the case for new art and work outside the mainstream, especially the creations of feminists like Judy Chicago; photorealism; art with gay content; and the pattern and decoration art associated with the Holly Solomon Gallery. Los Angeles Times: It’s his writing that has always proved most inspirational to me: clear-eyed and accessible, yet also incisive. He wrote the sorts of pieces that make a statement without dipping into dreaded artspeak. In the wake of his death, friends and artists have been sharing his work on social media, and it’s been a joy to go down the rabbit hole of his words. ARTnews: Perreault is best known for being an early proponent of avant-garde movements like Minimalism, Land art, and Pattern and Decoration during the late 1960s and the ’70s. It helped that Perreault was closely integrated into the New York art world of his time. He staged a performance called Critical Mass at the Whitney Museum of American Art in 1971. He also had an eye for artists who would ultimately become canonical. As a result, he achieved a following from artists, critics, curators, and readers of all kinds. Village Voice: I remember laughing out loud at my first sight of John Perreault’s white-toothpaste tondos — so many ideas gamboled off those roiling, bright surfaces: Robert Ryman’s thickly applied oil paint; the toxicity of traditional art materials (artists contracted “painter’s colic” from contact with white lead); the hoary art-school prohibition against using paint straight from the tube; and, since Perreault was a well-known writer, Jasper Johns’s “The Critic Smiles,” which substitutes teeth for the bristles of a toothbrush. But taut theory and tangy wit were ultimately subsumed in the chunky litheness of Perreault’s unexpected medium and in his gregarious handling, which combined to imbue this work with a beguiling and bodily presence. 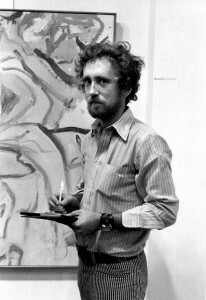 siLive: Perreault, who was also a critic, poet, novelist, educator and painter, became director of visual arts at the Newhouse in 1985, and in a short three-year tenure, transformed the modest on-site art program, moving it from the low-ceilinged and unsuitable Lower Great Hall into the four, purpose-designed galleries it occupies today.